During a three-year study by researchers in Canada, people showed more restraint when eating regular-size candy bars than when eating mini ones. Bite-size snackers tended to eat four or five treats – about 50 percent more than the full-sized candy bar eaters consumed. That’s why I only eat regular sized candy bars! 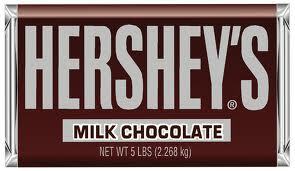 This entry was posted in Culinary and tagged chocolate, Hershey's. Bookmark the permalink.